Paperback, 4.75 x 7.5 in. / 480 pgs. The Swiss artist Miriam Cahn (born 1949) addresses political (particularly feminist) themes across numerous mediums, from oil painting and charcoal, chalk and pencil drawing to photography, film and installation. Throughout these mediums, Cahn consistently supplies commentary in which she addresses aesthetic and political topics; in both exhibitions and publications, these texts are presented alongside the works themselves. 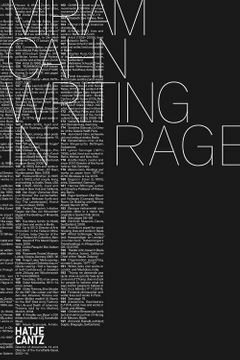 Writing in Rage is the first compilation of Cahn’s writing. It includes essays, journal entries and correspondence with friends, foes, family members and gallerists. The book provides intimate insight into Cahn’s life, her family, her work and the art market, introducing the reader to a disputatious, independent spirit. FORMAT: Pbk, 4.75 x 7.5 in. / 480 pgs.